Data from search engines mirrors Tor's own statistics: more and more Russian users show interest. Images mixed by Tetyana Lokot. As a new United Nations report recognizes encryption software and anonymizing tools as “essential to free speech,” the Russian authorities are toughening their stance on anonymity software. 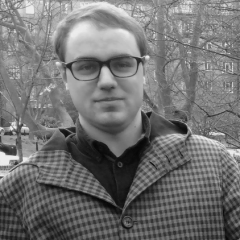 Lawrence Alexander uses open data to examine the rapid growth in Tor use on the RuNet—and to ask what might be driving this trend. The Tor browser is one of the most popular anonymizing tools used globally to access content that might be blocked or blacklisted, as well as to preserve user privacy. Initially a research project funded by the U.S. Navy, Tor is now run by a nonprofit group, though it continues to receive federal funding. 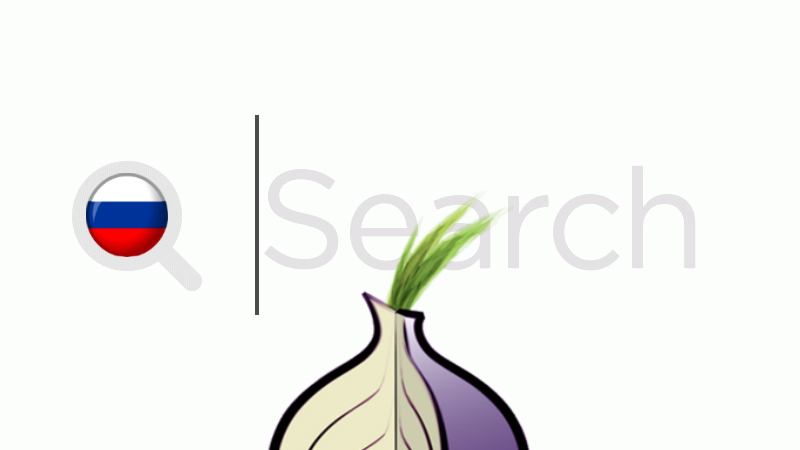 The Tor browser anonymizes Internet traffic by sending it through a unique configuration of nodes known as an onion routing system. The network boasts over 4 million users worldwide (as of November 2013), including many tech activists in countries where online censorship and surveillance are common. 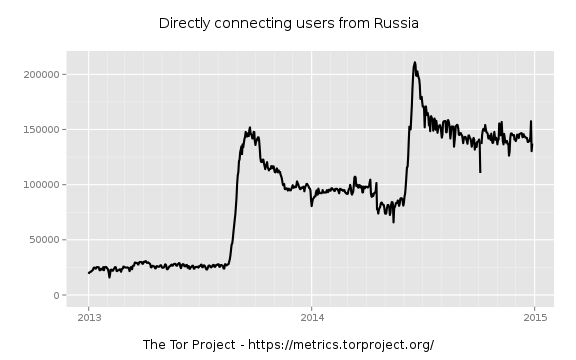 The Tor Project provides public statistics on user connections, and the results can be narrowed down to a specific country, which allows us to get an estimate of how many users in Russia use the Tor network. Tor connections from Russia, 2013-15. 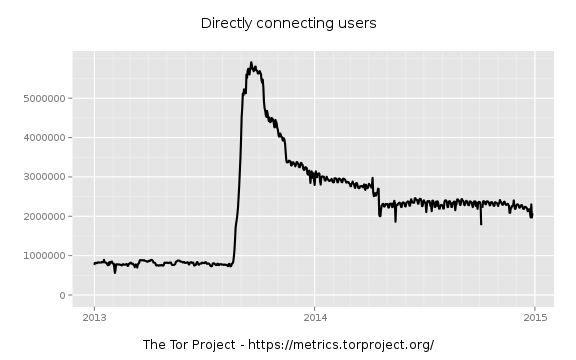 There is a significant, clear increase in Tor connections from Russia over the past two years; however, the initial spike in 2013 may be misleading. Worldwide Tor data for the same period shows an almost identical trend, which has been attributed to malware activity on the network. Worldwide Tor connections during 2013-2015. But while the number of global connections tapered off following the malware attack, in Russia they continued to climb instead, reaching an all-time high in the summer of 2014. 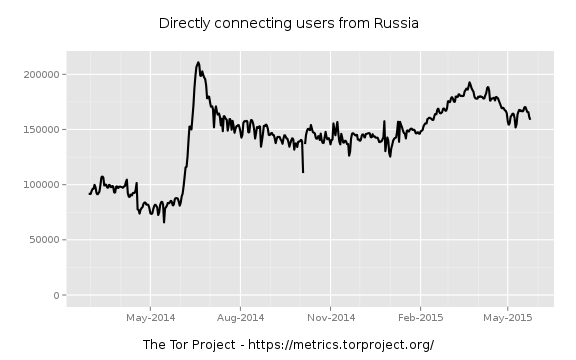 Rapid surge in Russian Tor usage can be seen in mid-2014. What caused this sudden leap of over 60%? Can these figures be attributed to real users, or a second botnet outbreak? The data on what and how often Russians are searching for on Google.ru and Yandex—two of the country's most popular search engines—may provide a clue. Over the same two-year period (2013-2015), there was a major increase in searches for “tor browser скачать” (“tor browser download”) from Russia. This phrase was listed by Yandex Wordstat as a popular query related to Tor, and I chose it because it suggests an intention to use the software, rather then simply to research it or to get information about it. Yandex searches for phrase “tor browser скачать” (“tor browser download”) from Russia, 2013-15. The Google Trends data for Russia shows a similar increase in search volume, with big peaks in the summer of 2014 and a high concentration of activity in the first half of 2015. 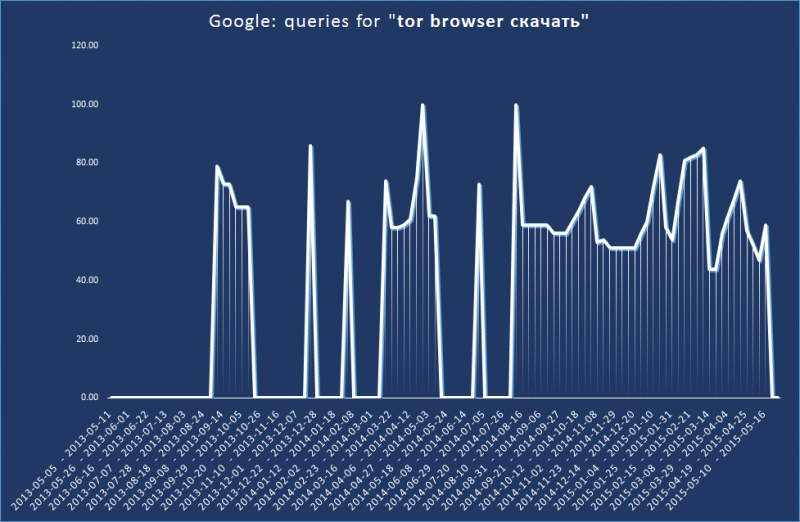 Google searches for phrase “tor browser скачать” (“tor browser download”) from Russia, 2013-15. In both cases, the search data tends to mirror that of the Tor Metrics, with only moderate activity prior to the 2013 spike. Yandex's global statistics for “tor browser скачать” confirm that the majority of searchers are based in Russia, residing in the major cities and urban areas. Moscow strongly dominates the list, just as it did in Google Trends. This is probably a reflection of population density and internet penetration, but a younger urban demographic, which tends to be more savvy and curious about circumvention tools, may have also influenced the trend. 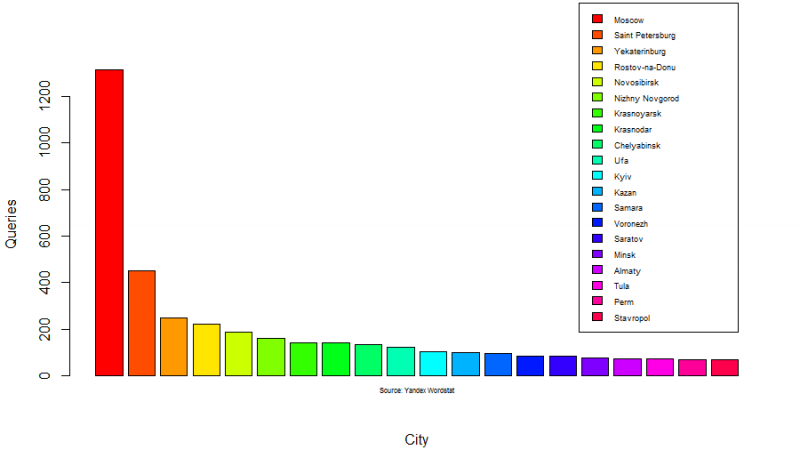 Top 20 cities of users searching for “tor browser скачать” on Yandex. What is driving this ongoing three-year increase in Russian anonymizer adoption and usage? As RuNet Echo has extensively documented throughout the period, the Russian government has been steadily tightening its grip on Internet freedom—and the increase in censorship closely mirrors the upward trend in interest towards Tor. After initially introducing blocks on content related to self-harm and drug use, the Kremlin then instituted its own take on SOPA in the summer of 2013, and later that year made moves to prevent access to websites promoting unsanctioned public protests. Increasingly draconian crackdowns on opposition media websites and Internet activists followed in the spring of 2014—accompanied by a huge surge in Tor searches on Google.ru. As government regulations become more restrictive, more Russian citizens are adopting online circumvention tools to preserve their access to information, freedom of expression, and anonymity. In response, the Kremlin seems to be eager to curtail the use of the very software that facilitates them. Although Tor and other anonymizers are not officially banned in Russia, it is increasingly clear they're viewed as a threat to the tight control Russia seeks to retain over its mainstream media as well as the online information and communication spheres.